Members of civil society groups sit to protest the abduction of Chibok schoolgirls during a rally pressing for the girls’ release in Abuja, Nigeria, May 6, 2014. Today marks a somber anniversary in Nigeria—and indeed around the world. It’s been one year since the Islamist extremist group Boko Haram abducted more than 200 schoolgirls from the northeast-Nigerian town of Chibok. His comment about an honest approach is apparently an attack on the outgoing president, Goodluck Jonathan. Buhari, a former military dictator, defeated Jonathan at the polls on March 28. At first Jonathan denied reports of the mass kidnapping when the news began emerging last year. He later “made hollow promises” to rescue the girls, AP states. The abductions ignited outrage against the Islamist group and anger that Jonathan was making little effort to rescue them. Protests that reached America’s shores centered on the hashtag #BringBackOurGirls. But many are losing hope of finding the 219 schoolgirls who remain missing. 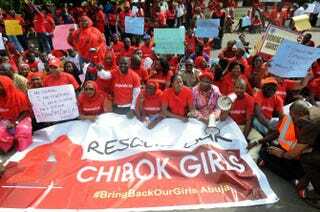 The “Bring back our girls” slogan has given way to “Never to be forgotten,” AP reports. Boko Haram’s leader, Abubakar Shekau, has said that the girls were forced to convert to Islam and were married to his fighters. After acknowledging that the girls may never be found, Buhari had this to say to the relatives and friends of the abducted girls: “[M]y government will do everything in its power to bring them home,” according to AFP. Read more at the Associated Press and AFP.